Got an hour to kill? Want to see Just Cause 3 in action? 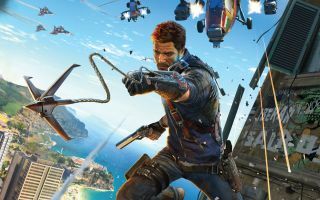 Then this, my friend, is your lucky day, because as you may have already soothsayed, the first hour of Just Cause 3 gameplay is now on the tubes. The video includes the opening credits, a brief introduction of the game's central characters, and a tourist's-eye view of Medici, the Mediterranean-inspired island that's under the control of the despotic General Sebastiano Di Ravello. The actual gameplay begins when Rico climbs onto the roof of a small airplane—while it's in flight—and proceeds to bomb the city it's flying over with an RPG, which of course has unlimited ammunition. Subtle, like I said. As Square Enix notes, your mileage will vary in a game like this. "Your first hour of play might be different to ours," it wrote on YouTube. "But we thought we'd focus on some of the early missions and content to whet your appetite ahead of next week's launch." That, to be a bit more specific about it, will happen on December 1. The system requirements were revealed yesterday.